Brewing is an important skill in Minecraft. Players can brew potions and splash potions using a special Brewing Stand. These potions feature a wide range of useful benefits, including healing effects, resistance, and more. Brewing might seem intimidating at first, but it doesn’t take long for players to catch on. To brew a potion, players first start with a Glass Bottle. Then, players fill that Glass Bottle at a nearby water source (or at a cauldron) to turn it into a water bottle. Once players have a water bottle, they can start brewing different types of potions. Most potions can be brewed by adding nether wart into a water bottle to create an Awkward Potion. By default, Awkward Potions do not have any effects, and players must add more ingredients to make the potion useful. There are common themes among brewing ingredients in the Minecraft world. For example, adding Redstone to an Awkward Potion will make it last longer, while adding Glowstone Dust will make the potion more powerful. A Fermented Spider Eye corrupts potions to deal damage, while Gunpowder turns any potion into a splash potion, which means that it can be thrown at enemy mobs to deal damage. -Brewing Stand: A Brewing Stand is the first thing you need to start brewing potions. Using the Brewing Stand, players can add ingredients into glass bottles. Brewing Stands are crafted by opening a 3×3 crafting window, placing 3 cobblestones along the bottom row, and then one blaze rod in the center of the middle row. -Cauldron: A Cauldron holds exactly one bucket of water, which is enough to fill three glass bottles. -Glass Bottles: Glass Bottles must be filled with water in order to create all of the potions in the Minecraft world. The Glass Bottle is the basic potion container. -Water Bottle: This is the starting base for all types of potions. To create a Water Bottle, simply fill a Glass Bottle at any water source. Or, fill up a Glass Bottle at your cauldron. Nether Wart: Add Nether Wart to a Water Bottle to create an Awkward Potion. Glowstone Dust: Add Glowstone Dust to a Water Bottle to make a Thick Potion. Redstone Dust: When added to a Water Bottle, Redstone Dust creates a Mundane Potion with an extended duration. Fermented Spider Eye: Fermented Spider Eye will create a potion of weakness after being added to a Water Bottle. Awkward Potion: Awkward Potions are created by combining Nether Wart with a Water Bottle. Like other primary potions, Awkward Potions have no effects, but they lead to the creation of Potions of Healing, Fire Resistance, Poison, Regeneration, Strength, and Swiftness. 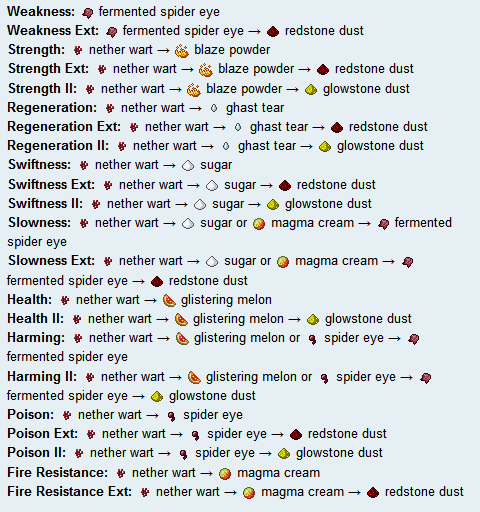 Mundane Potion: Mundane Potions are created by combining a number of different ingredients to a water bottle, including a Ghast Tear, Glistering Melon, Blaze Powder, Sugar, Spider Eye, or Magma Cream. They can be used to create a Potion of Weakness. 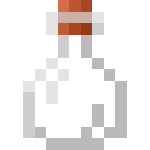 Mundane Potion (Extended): Mundane Potions (Extended) are created by adding Redstone Dust to a Water Bottle. Mundane Potions don’t have any effects, and they can only be used to create a Potion of Weakness (Extended). 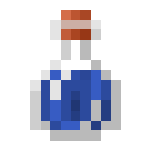 Thick Potion: Thick Potions are brewed by adding Glowstone Dust to a Water Bottle. They have no effects, and they can only be used to create a Potion of Weakness. Secondary potions are the result of combining primary potions with other ingredients. Each of these secondary potions can be combined with gunpowder in order to create a throwable splash potion. Potion of Healing: Brewed by combining Glistering Melon with an Awkward Potion. This restores 3 health potions (i.e. three full hearts on the health bar) per potion. The duration is instant. Potion of Fire Resistance: Brewed by combining Magma Cream with an Awkward Potion. This potion gives immunity to any type of fire damage, including lava and ranged Blaze attacks. This effect lasts for three minutes. Potion of Regeneration: Brewed by combining Ghast Tear with an Awkward Potion. The Potion of Regeneration restores health over a 45 second period of time. Approximately one full heart of health is restored every 2.4 seconds. Potion of Strength: Brewed by combining Blaze Powder with an Awkward Potion. The Potion of Strength adds 1.6 heart points’ worth of damage to all melee attacks with or without weapons. This buff lasts for exactly 3 minutes. Potion of Swiftness: Brewed by combining Sugar with an Awkward Potion. The player’s movement speed is noticeably increased for 3 minutes. This means faster walking, sprinting, and jumping distance. Potion of Poison: Brewed by combining a Spider Eye with an Awkward Potion. When taken, it will poison the player for 45 seconds, during which health is reduced by half a heart every 1.6 seconds. Potions of Poison will not drop players below half a heart of health. Potion of Weakness: Brewed by combining Fermented Spider Eye with an Awkward Potion or by combining Thick Potion/Mundane Potion with a Fermented Spider Eye. The Potion of Weakness will reduce all melee attacks by one full heart of damage, which makes it impossible to cause damage without a weapon. This effect lasts for 1 minute, 30 seconds. Potion of Weakness (Extended): Brewed by combining Fermented Spider Eye with a Mundane Potion (Extended). The Potion of Weakness (Extended) has the same effects as a Potion of Weakness, except that the duration is 4 minutes as opposed to 1 minute, 30 seconds. In order to create tertiary potions, players must add an ingredient to a secondary potion or add an ingredient to a tertiary potion. All tertiary poisons can be combined with Gunpowder in order to create throwable splash potions. Potion of Fire Resistance (Extended): Brewed by combining Redstone dust with a Potion of Fire Resistance. Either the Base or Reverted versions of the Potion of Fire Resistance can be used. This potion gives immunity to all fire-based damage, including fire, lava, and ranged Blaze attacks. It lasts for 8 minutes. Potion of Healing II: Brewed by combining Glowstone dust with a Potion of Healing. Either the Base or Reverted versions of the Potion of Healing can be used. The Potion of Healing II restores six heart points per potion and it takes effect instantly. Potion of Regeneration (Extended): Brewed by combining Redstone Dust with Potion of Regeneration Level I or II. The Potion of Regeneration (Extended) restores one full heart on the health bar every 2.4 seconds. The effect lasts for 2 minutes. Potion of Regeneration II: Brewed by combining Glowstone Dust with a Potion of Regeneration (Base or Extended). The Potion of Regeneration II will restore one full heart on the health bar every 1.2 seconds, and the effect lasts for 22 seconds. Potion of Strength (Extended): Brewed by combining Redstone Dust with a Potion of Strength Level I or II. The Potion of Strength will add 1.6 heart points’ worth of damage onto all melee attacks (with or without weapons). The effect lasts for 8 minutes. Potion of Strength II: Brewed by combining Glowstone Dust with Potion of Strength. Both the Base and Extended versions of the Potion of Strength can be used. The Potion of Strength II will add three full heart points’ worth of damage onto every melee attack (with or without weapons). The effect lasts for 1 minute, 30 seconds. Potion of Swiftness (Extended): Brewed by combining Redstone Dust with a Potion of Swiftness I or II. The Potion of Swiftness (Extended) increases the player’s movement speed by the same amount as the Potion of Swiftness, although the effect lasts for 8 minutes. Potion of Swiftness II: Brewed by combining Glowstone Dust with a Potion of Swiftness (Base or Extended). This will increase player’s movement speed by twice as much as a regular Potion of Swiftness (40% increase in sprinting, movement, and jumping length). The effect lasts for 1 minute, 30 seconds. Potion of Harming: Brewed by combining Fermented Spider Eye with either a Potion of Healing or a Potion of Poison. The Potion of Harming will instantly inflict three full hearts’ worth of damage. Potion of Harming II: Brewed by combining Fermented Spider Eye with either a Potion of Healing II or a Potion of Poison II. 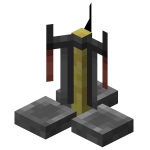 The Potion of Harming II can also be brewed by combining Glowstone Dust with a Potion of Harming (base or reverted). This will instantly cause six full hearts’ worth of damage. Potion of Poison (Extended): Brewed by combining Redstone Dust with a Potion of Poison I or II. This will drain health from the player for 2 minutes at a rate of half a heart every 2 seconds. The player’s health can drop to a minimum of half a heart. Potion of Poison II: Brewed by combining Glowstone Dust with a Potion of Poison. This will poison the player for 22 seconds at a rate of one full heart every second (to a minimum health bar level of half a heart). Potion of Slowness: Brewed by combining Fermented Spider Eye with a Potion of Fire Resistance or a Potion of Swiftness. The Potion of Slowness will reduce a player’s movement speed to crouch speed for 1 minute, 30 seconds. Potion of Slowness (Extended): Brewed by combining Redstone Dust with a Potion of Slowness. Both the Base and Reverted versions of the Potion of Slowness will work. It can also be brewed by combining Fermented Spider Eye with a Potion of Fire Resistance (Extended) or with a Potion of Swiftness (Extended). After taking a Potion of Slowness (Extended), a player’s movement speed will drop to crouch speed for 3 minutes. Potion of Weakness: Brewed by combining Fermented Spider Eye with a Potion of Strength or a Potion of Regeneration. When taken, the Potion of Weakness will reduce the effects of all melee attacks by one full heart’s worth of damage, which means players will need a weapon to cause any sort of damage. This effect will last for 1 minute, 30 seconds. Potion of Weakness (Extended): Brewed by combining Fermented Spider Eye with a Potion of Strength (Extended ) or a Potion of Regeneration (Extended). Potions of Weakness (Extended) can also be brewed by combining Redstone Dust with a Base or Reverted Potion of Weakness. When players take the Potion of Weakness (Extended), it will reduce the damage caused by all melee attacks by one full heart, making it impossible to cause damage without using a weapon. This effect will last for 4 minutes. Reverted potions have the same effects as normal potions, and they look identical to base potions in the inventory screen. However, reverted potions will not turn into base potions when adding Fermented Spider Eye. Instead, they’ll “revert” to remain as reverted potions. In other words, reverted potions are those that have been legitimately obtained by adding glowstone or redstone to a potion that has already been upgraded. Since the upgraded potion does not support the added ingredient, the result is a corrupted (reverted) potion. Reverted potions can also be created by adding Fermented Spider Eye to a potion that has already been upgraded with glowstone or redstone. Potion of Fire Resistance (Reverted): Brewed by combining Glowstone Dust with a Potion of Fire Resistance (Extended). The Potion of Fire Resistance (Reverted) will make players immune to any damage caused by ranged Blaze attacks, lava, and fire. This effect will last for three minutes. Potion of Slowness (Reverted): The Potion of Slowness (reverted) is brewed by combining Glowstone Dust with a Potion of Slowness (Extended). It will slow player movement speed to a crouch for 1 minute, 30 seconds. Potion of Weakness (Reverted): Brewed by combining Glowstone Dust with a Potion of Weakness (Extended). This will reduce the damage caused by all melee attacks by one full heart point, and the effect lasts for 1 minute, 30 seconds. Potion of Healing (Reverted): Brewed by adding Redstone Dust to a Potion of Healing II. This will instantly restore three full health points when taken. Potion of Harming (Reverted): Brewed by combining Redstone Dust with a Potion of Harming II. This will instantly cause three health points of damage. Potion of Harming (Reverted): Brewed by combining Fermented Spider Eye to a Potion of Healing (Reverted) or to a Potion of Poison (Extended). This will instantly cause three heart points’ worth of damage. Potion of Slowness (Reverted): Brewed by combining Fermented Spider Eye to a Potion of Fire Resistance (Reverted) or to a Potion of Swiftness II. Causes player’s movement speed to slow down to crouch speed for 1 minute, 30 seconds. Potion of Weakness (Reverted): Brewed by adding Fermented Spider Eye to a Potion of Strength II or to a Potion of Regeneration II. The Potion of Weakness (Reverted) will reduce all melee attacks (with or without weapons) by one full heart’s worth of damage. The effect lasts for 1 minute, 30 seconds. Here are the easiest ways to make each type of recipe in Minecraft. Simply take your Water Bottle, add the first ingredient, then add the second, then the third to end up with each type of potion. Using this information, you can create any potion in the game. Looking for additional trivia about Minecraft’s potion system? Want some tips and tricks to make brewing easier? Keep reading! -Brewing will take place as long as at least one of the three bottom slots in the brewing menu are filled. If all of the bottom three slots become empty at any point during the brewing process, brewing will immediately stop. 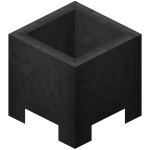 -If you try to upgrade a potion that goes to work instantly (like a health potion or Potion of Harming) with Glowstone Dust, then nothing good or bad will happen. The same can be said about trying to upgrade potions with no level II versions (like Potions of Weakness, Slowness, and Fire Resistance) by using Redstone Dust. -Glass Bottles can be stacked, but once you fill them with water, they can no longer be stacked. Keep this in mind when you’re trying to manage your inventory. -Undead mobs are affected differently by potions and poisons. Skeletons, zombies, and zombie pigmen gain health when hit by an instant damage potion, but they lose health when hit by an instant health splash potion. They are also unaffected by splash potions of regeneration and splash potions of poison.